It took not 1, not 2, but 3 different stores to find squash blossoms! 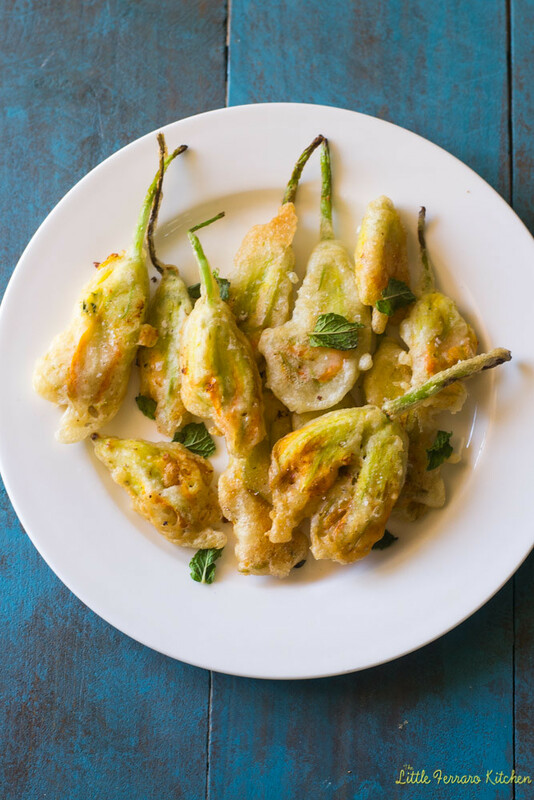 I have been obsessed with making ricotta stuffed squash blossoms ever since I did it for the 1st time last year. But it was a total flop! I followed someone else’s instructions of boiling them for a few seconds. Which makes sense, but was a total disaster! The flowers are so fragile that attempting to stuff was nearly impossible. Therefore, I year later I decided to do it my way. Am the the only one that gets incredible passionate about this? How gorgeous are those beautiful blossoms. Perfectly fresh and eager for a summering filling. I talked about the 1st time Joe and I started shopping at Mexican markets. I mean, we are in the perfect area right in Southern California! We love walking through the mercados and loading up on chilles, tortillas and queso. Then as we were googling over their gorgeous produce section, I couldn’t believe my eyes wehn I turned around and saw a small pile of perfectly plump squash blooms! 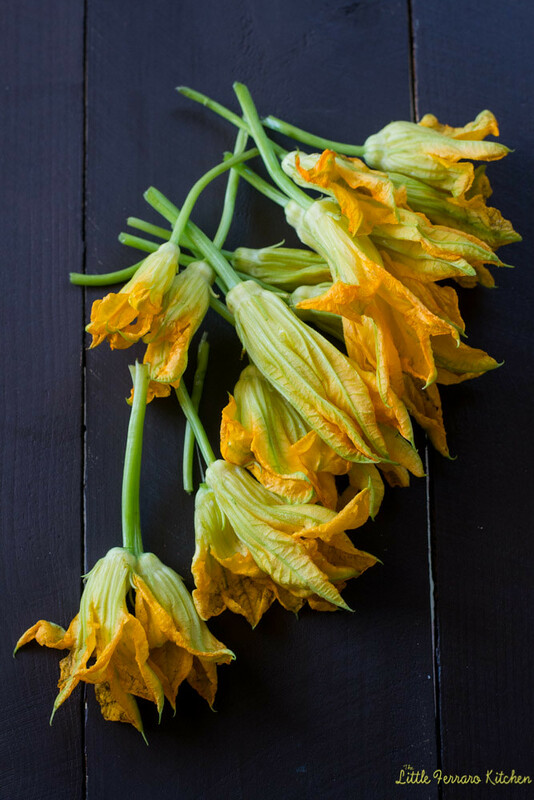 You have no idea how many farmers market vendors, how many Whole Foods, how many whatever-fancy-shamancy-boutique-foodie store I’ve been to asking them about squash blossoms! I even harvested a huge zucchini, but it was too late because the flower already grew into the fruit. Total flower letdown. I have to be honest. Frying is my least favorite method of cooking. I find it tiresome, heavy and loathe the smell of used oil afterwards. However, there are only a handful of things I will fry. And that is my mom’s famous latkes, because you should never bake latkes…ever!, these Persian doughnuts , some plantains and of course, ricotta stuffed squash blossoms. The filling couldn’t be simpler and more fresh. It is whole milk ricotta, 1 egg to help hold everything together, lemon zest and a small handful of fresh mint to brighten everything up. Once you stuff these and fry them up until golden perfection, you will not be able to stop. 1) First make the filling. 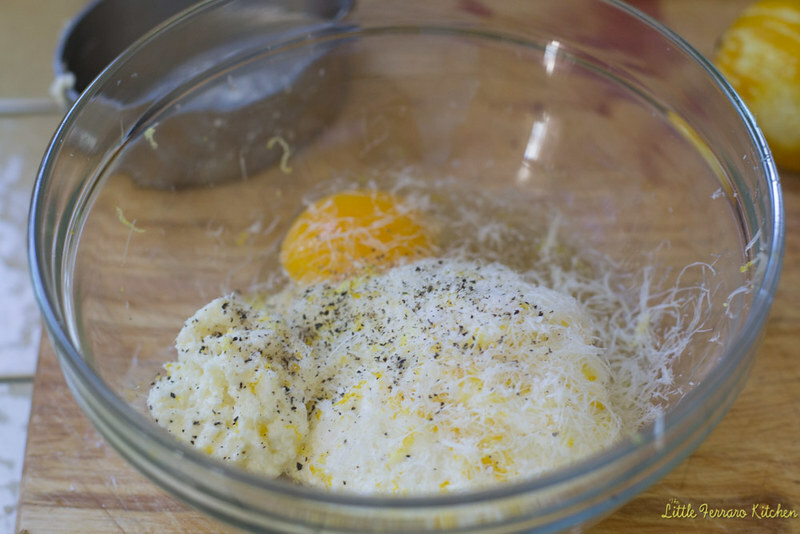 In a bowl, add ricotta, egg, Parmesan cheese, lemon zest, chopped mint and salt and pepper. Mix everything together. 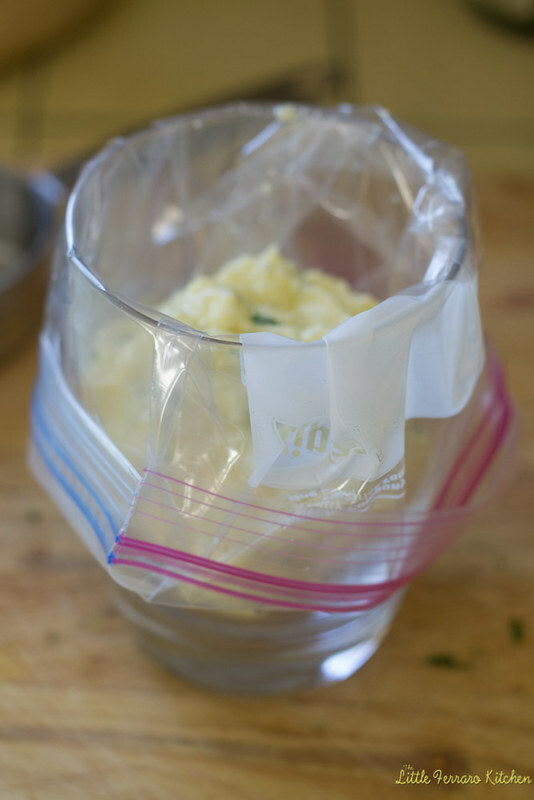 2) Use a Ziploc bag and open it up into a cup. This will help keep the filling in place. Spoon filling into the Ziploc bag, making sure it’s not too full. Close the bag, squeezing out as much air as you can and set aside. 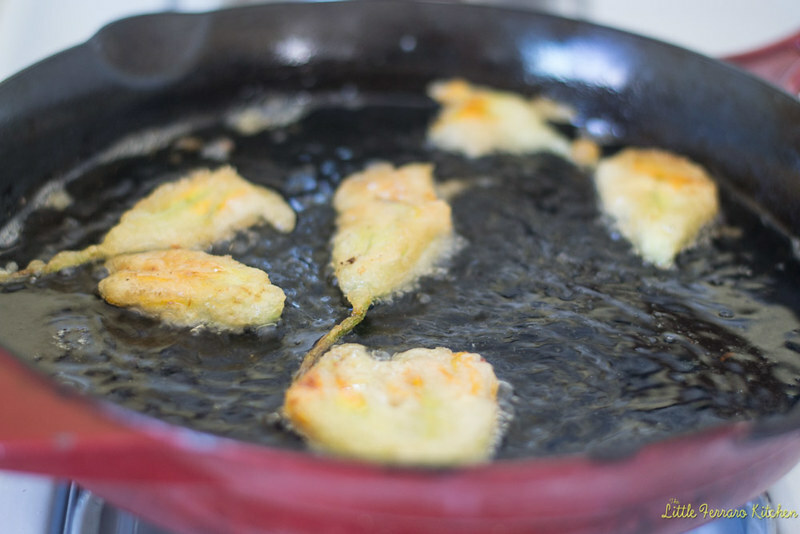 3) Clean the squash blossom carefully and wipe of any debris. Be careful not to tear the delicate petals..
4) Heat up a large skillet with about 1/2 inch of canola or vegetable oil (or any high-heat oil you like). While the oil is heating up, make the coating. 6) Next, fill your blossoms. Snip a tiny corner off the Ziploc bag and carefully open the blossom. Pipe in the ricotta mixture so it fills the cavity, but not too much that it overflows. Twist the petals together and set aside. Repeat with the rest. 7) When all done, use the stem to dip the blossom into the batter. Allow excess batter to drip off. Slow drop the blossom into the hot oil. It should sizzle right away. Cook on 1 side for about 2 minutes until lightly golden brown and carefully flip to other side and cook for 1-2 minutes. 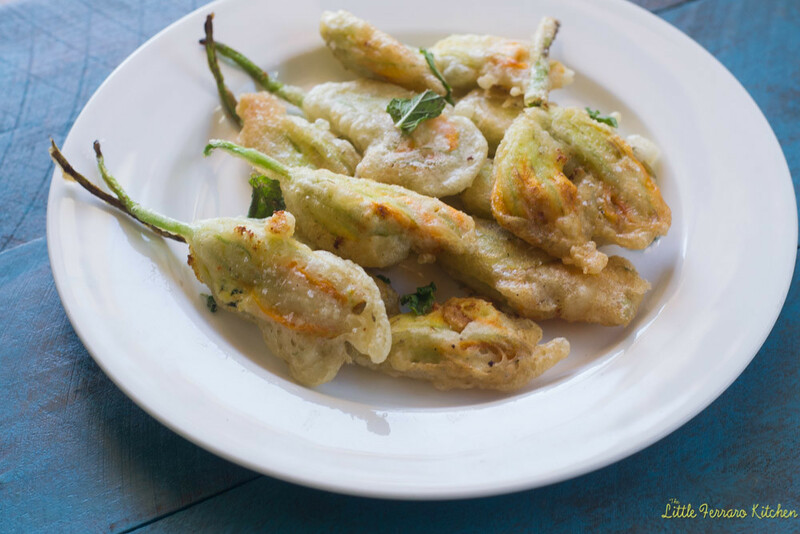 8) Have a paper towel lined baking sheet ready and when done, place fried squash blossoms onto towel. Immediately season with flaky salt on top. 2) Use a Ziploc bag and open it up into a cup. This will help keep the filling in place. Spoon filling into the Ziploc bag, making sure it's not too full. Close the bag, squeezing out as much air as you can and set aside. 5) In another bowl, add flour, salt and pepper and sparkling water. Whisk together until it looks like a pancake batter consistency. Shouldn't be too thick but easily drip. Consequently mouth watering! That appears amazing. I just discovered your website and I’m enjoying reading it. 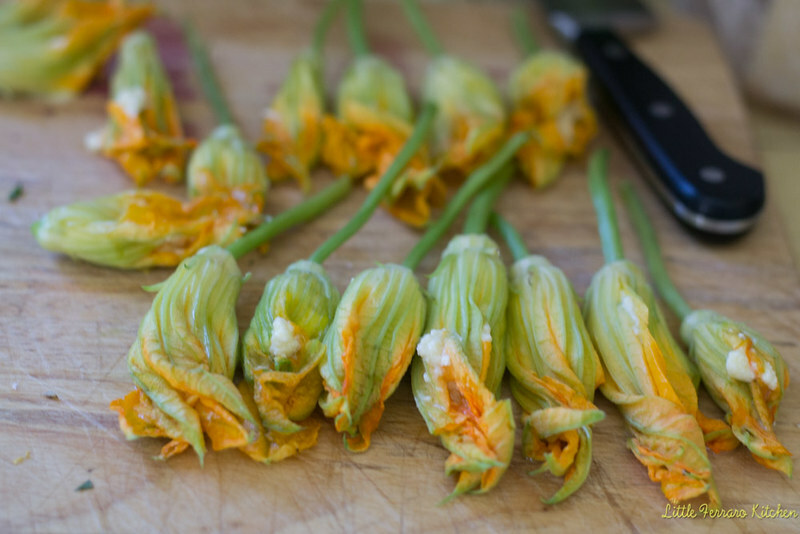 The Ricotta Stuffed Blossoms looks lovely. I have a question. 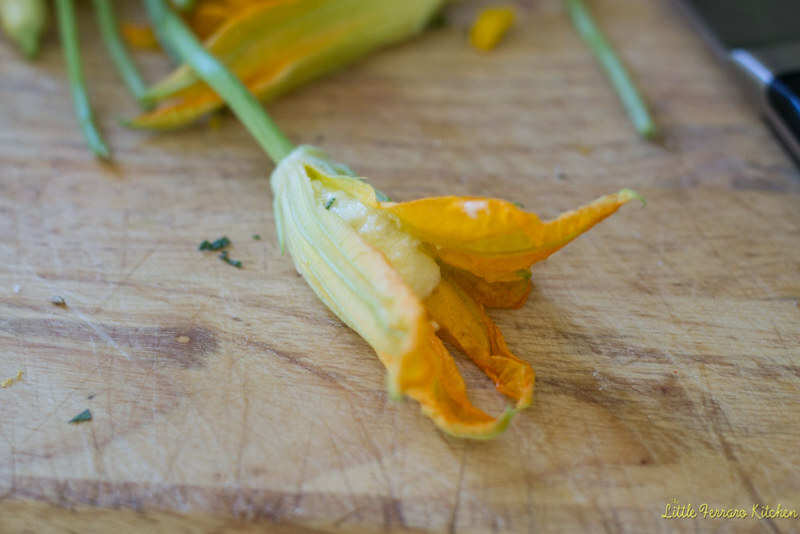 The only times I eaten zucchini blossoms has been in Italian restaurants and served with marinara sauce. Is that your suggested way of serving this dish? I would think the lemon zest and the mint would be overwhelmed by marinara sauce.